1. 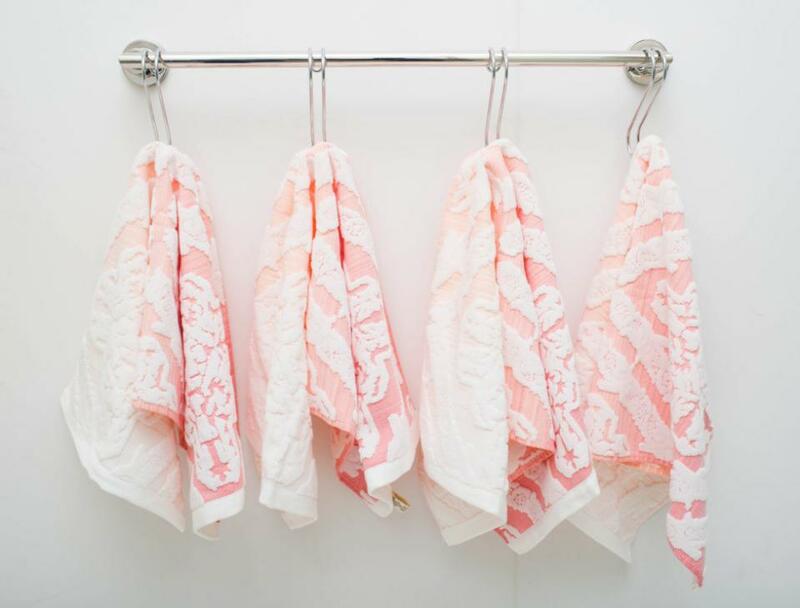 Use a wine rack as a holder for rolled hand towels. Your guests will be so impressed. 2. 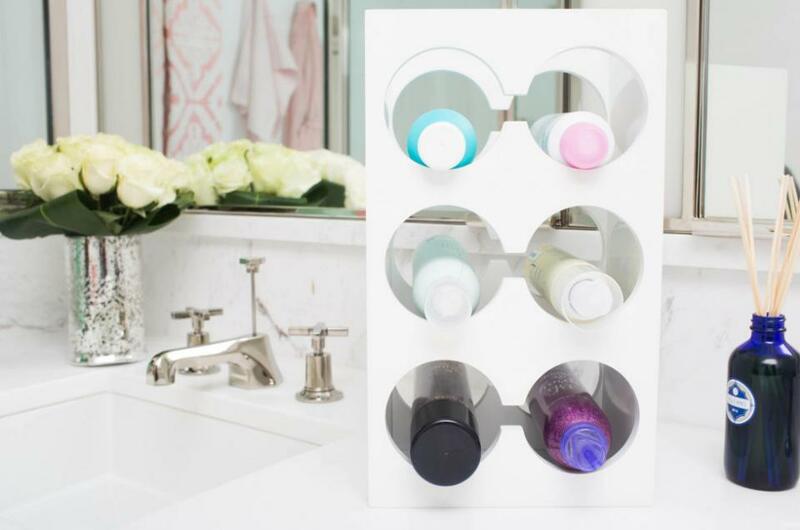 Use a kitchen utensil tray to organize your bathroom toiletries. You'll get much better use out of one of these in your bathroom drawer than in your kitchen. 3. If you lack cabinet space, roll your extra bath towels and display them in a decorative basket. You'll be surprised how much room you'll save by rolling your towels instead of folding them. 4. 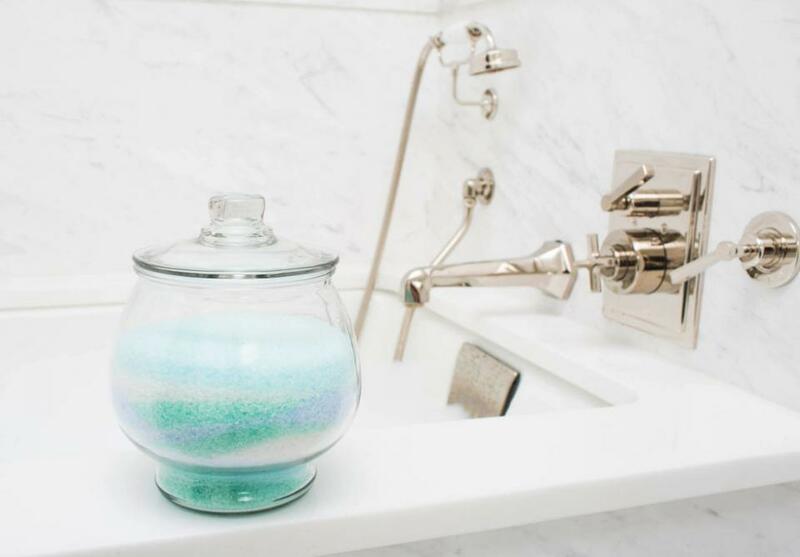 Consolidate multiple bags and jars of bathtub salts into a clear cookie jar. 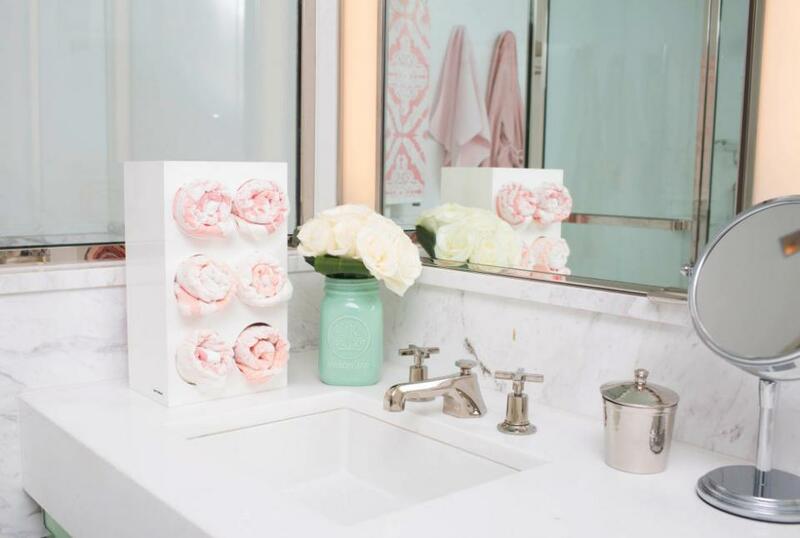 Not only will this save space, but it also makes cute bathroom decor. 5. 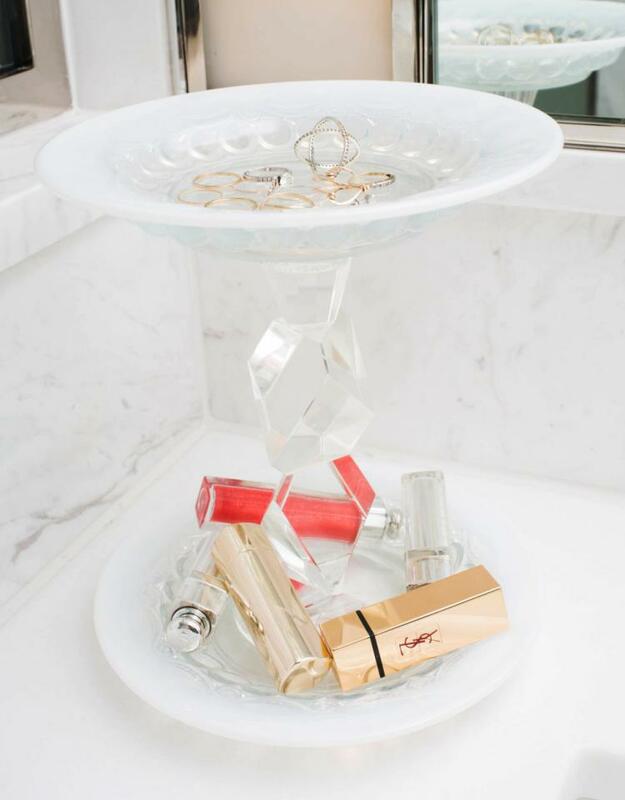 Make your own storage stand out of two plates and a candlestick holder. To do so, superglue the bottom of the candlestick holder, press it down onto the center of the bottom plate, and hold it for a few minutes. After it dries, spread glue along the top of the candlestick holder and set the second plate on top. 6. 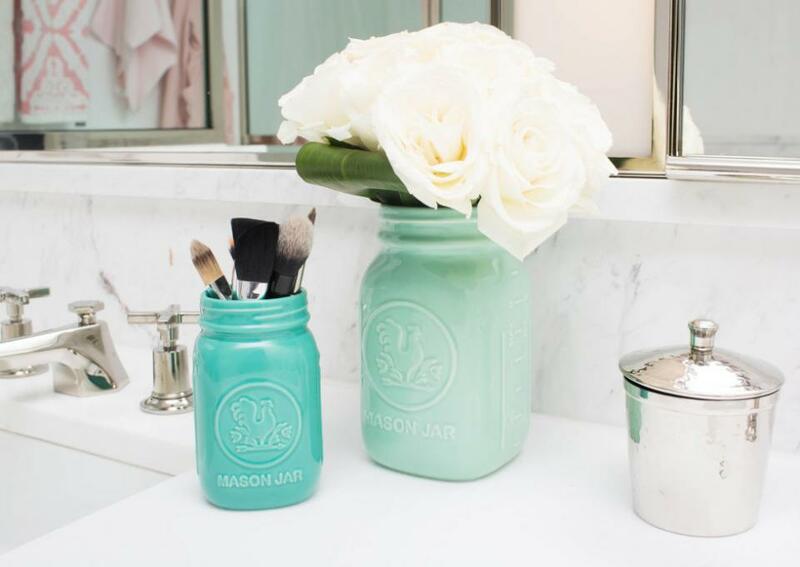 Use old mason jars to hold your makeup brushes. An easy way to add some vintage style to your bathroom. 7. 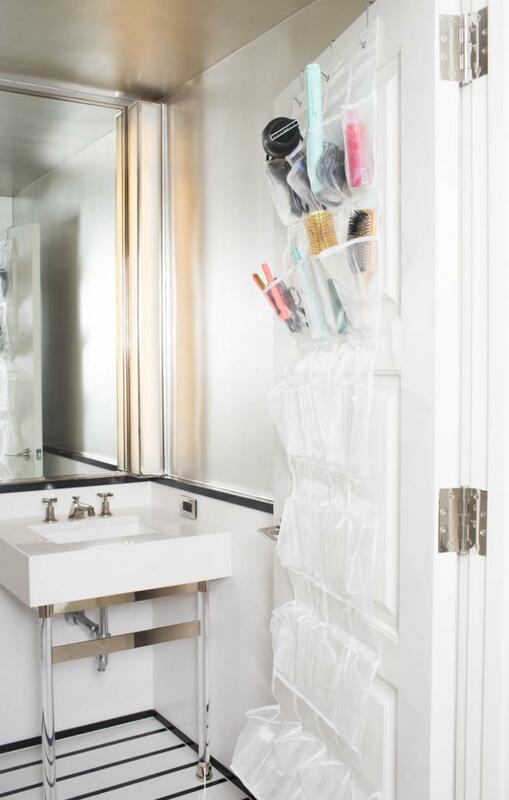 Use a hanging shoe organizer to store larger beauty products that take up a lot of space. This will also make your products much more accessible than if they were tucked away in the back of a cabinet. 8. Create additional bathroom shelving by hanging a spice rack on the inside of your cabinets. This is great for the woman who owns more moisturizers and serums than spices. 9. 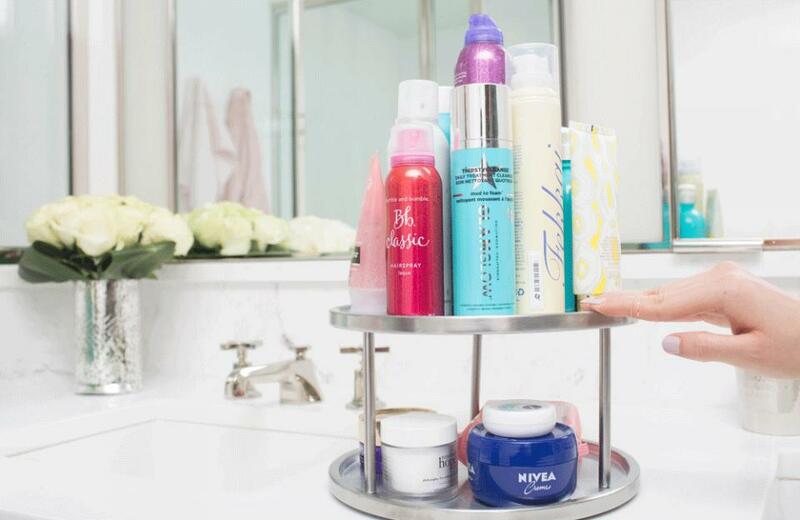 If you have a lot of beauty products, stack them on a lazy Susan to save space. Just spin the shelf around to find exactly which item you need. 10. Hang "S" hooks on your towel bars to create more drying space for your towels. 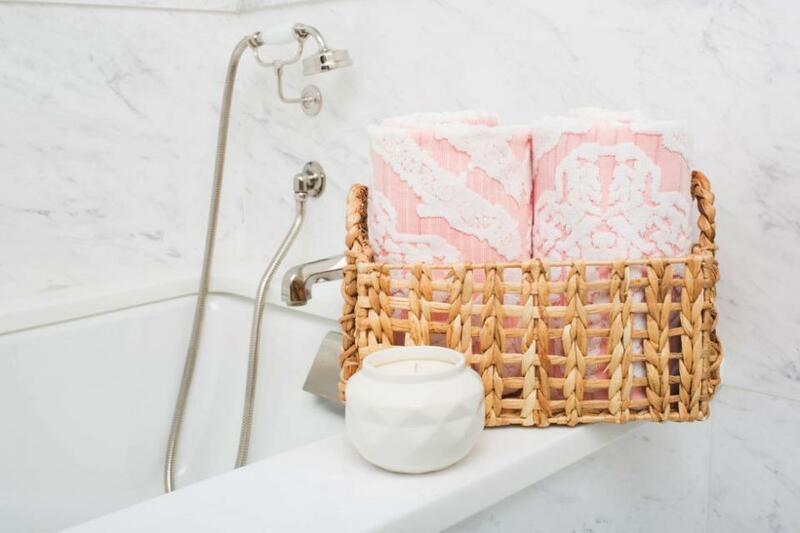 If you share a bathroom with multiple people, you know how tricky finding towel space can be and how ~*life-changing*~ this trick is. 11. Install a small tension rod under your sink to hang your cleaning supplies and allow more room below for storage. 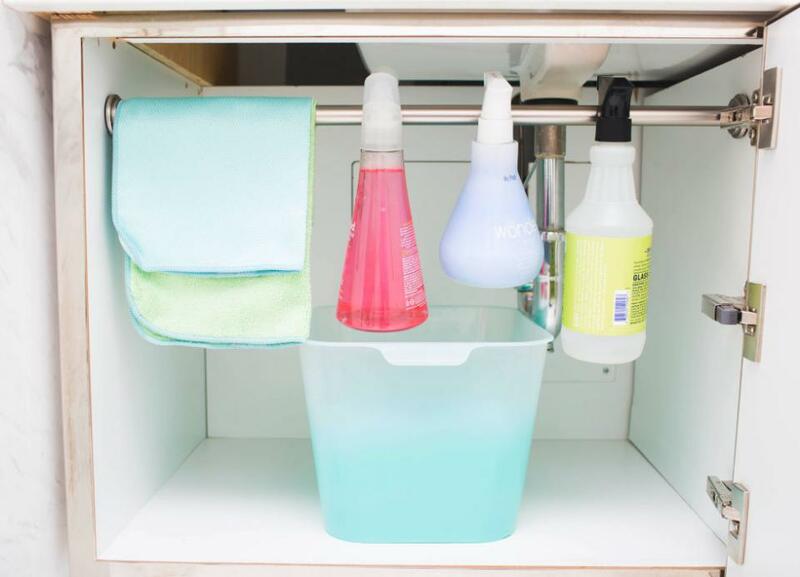 No one wants to waste precious real estate under the sink for storing cleaning supplies. 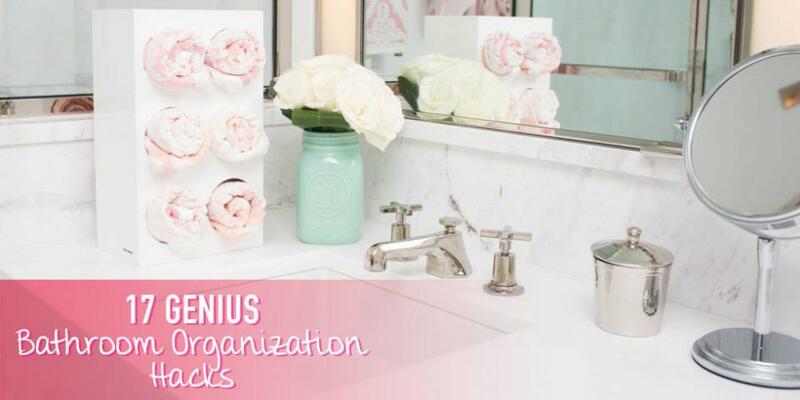 This hack will allow you to organize both your beauty products and cleaning supplies in harmony. 12. 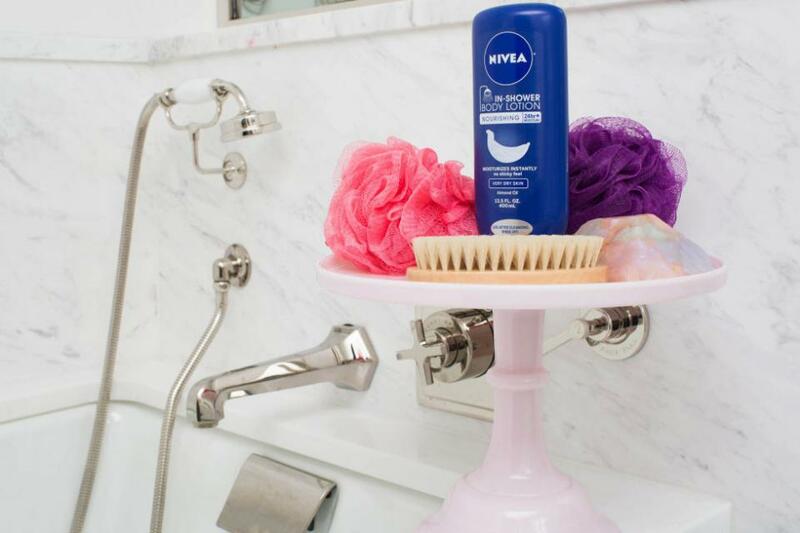 Use a cake stand to beautifully store your favorite shower products. 13. 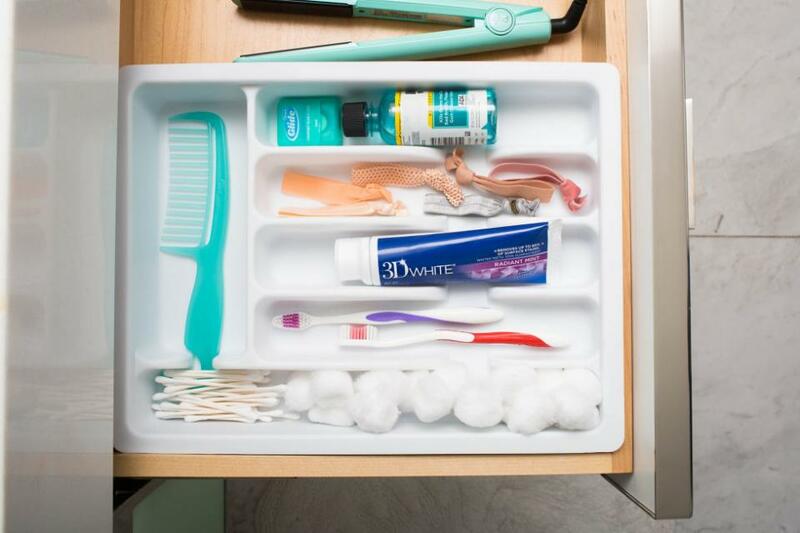 Stick adhesive wall organizers inside your medicine cabinet to store small, hard-to-find products. The smaller the product, the easier it is to lose in the abyss that is your bathroom cabinet. 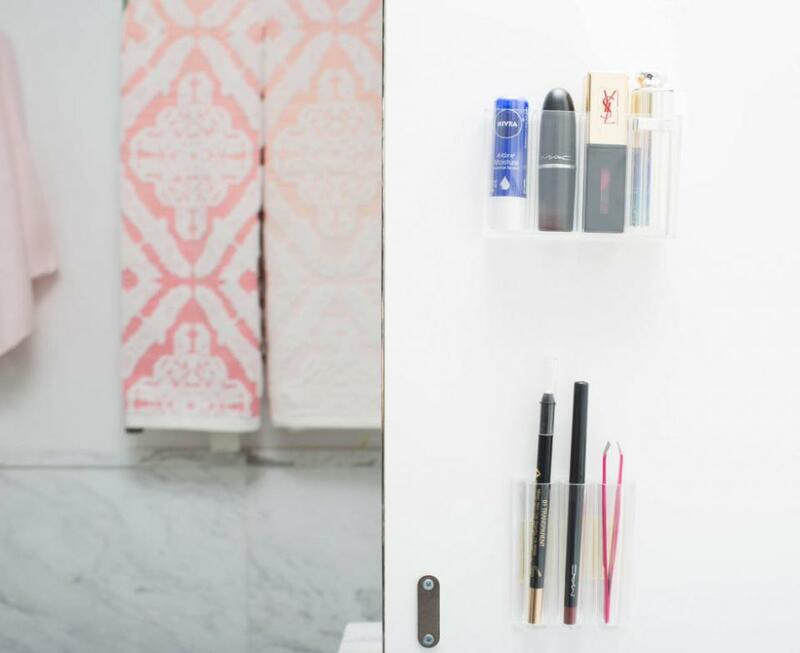 With these wall organizers, your lip balm will always be right where you left it. 14. 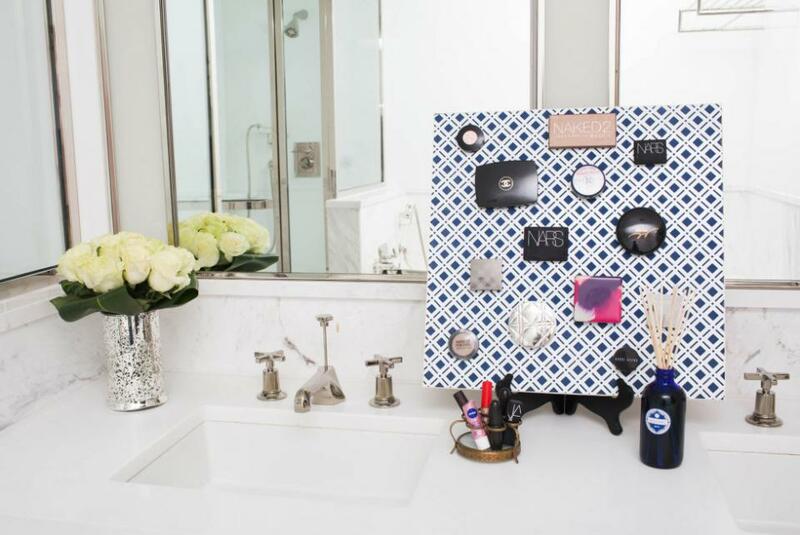 Adhere magnets to the back of your makeup compacts, and arrange them on a metal board to save space and make it easier to find what you need. You paid a lot of money for those beautifully packaged makeup compacts, so why not display them while you store them? 15. 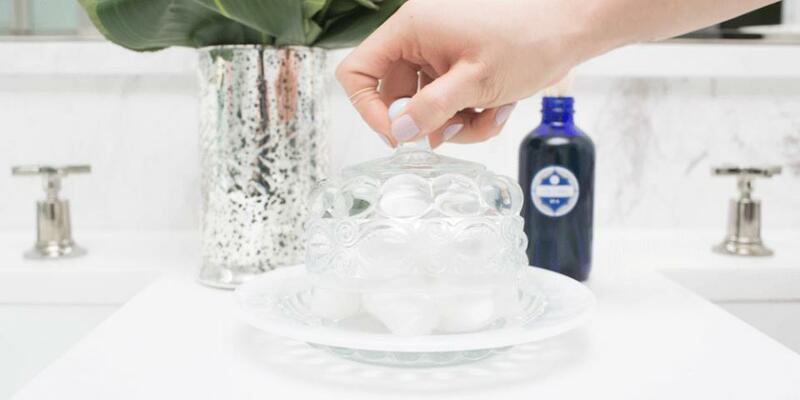 Use a pretty butter dish to hold and cover your cotton balls, sponges, and cotton swabs. Anything looks beautiful when stored in a vintage butter dish — even cotton pads. 16. 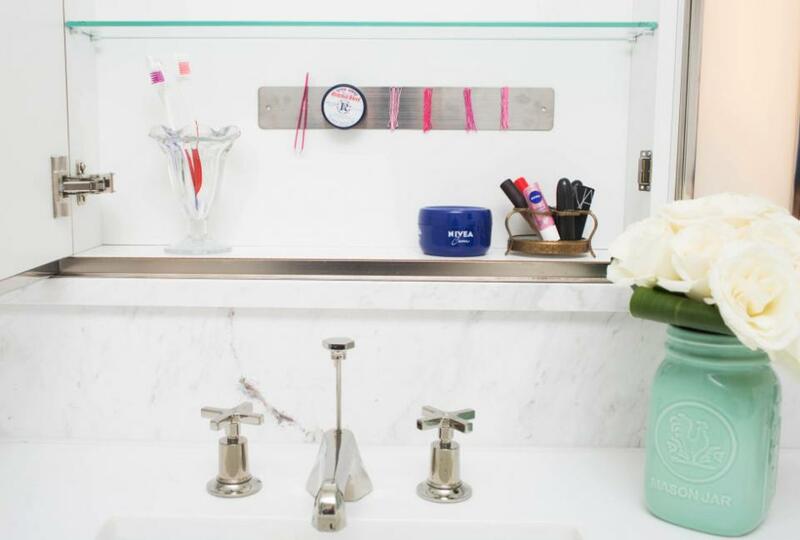 Hang a magnetic strip on the inside of your medicine cabinet to keep track of your tweezers, bobby pins, and other small metal items. Never lose your bobby pins again! 17. 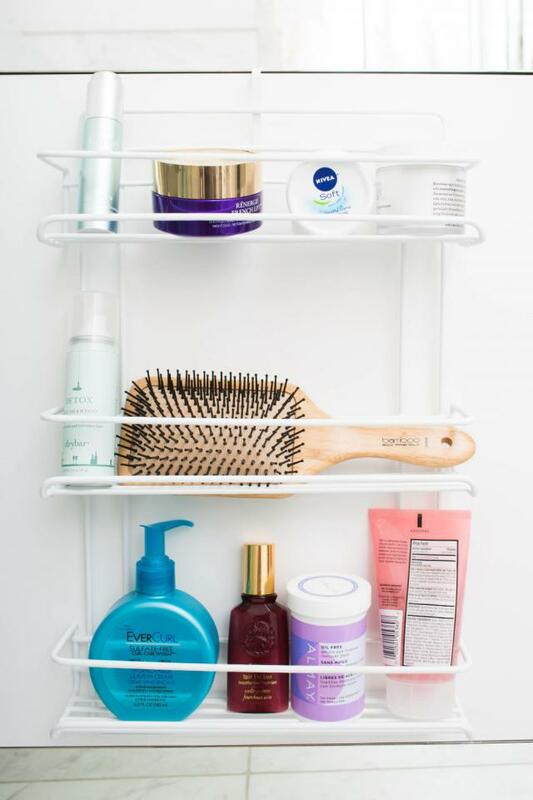 Store your hairstyling products in a wine rack to save counter space and make them easily accessible. Your new favorite way to use a wine rack.